Muay Thai is a martial art developed in Thailand. The basic offensive techniques in Muay Thai use hands, elbows, kicks and knees to punch and kick the opponent. This is also known as “The Science of Eight Limbs” as it employs these limbs to attack. This style is well known for its extensive use of the knees and elbow. No one knows exactly when Muay Thai was first practiced but it was considered a high art and part of the Thai Royal Court curriculum from around 1238AD. Apart from hand to hand uses in warfare, Muay Thai was considered a prestigious activity – with former Kings of Thailand sending their sons to train with temple monks as it was believed that bravery and fitness from training would lead to great and brave rulers. Around 1604, King Narai, a lover of sports, helped to make Muay Thai widely available and soon many local playgrounds featured roped off areas for boxing training. In 1767, Thailand was at war with the Burmese and a champion boxer Nai Kahnomtom was captured by the Burmese king Angwa. King Angwa called for a boxing match, the first Muay Thai match outside of Thailand and Nai Kahnomtom defeated all ten Burmese challengers in succession, with no rest at all between the ten fights. As a result, Nai Khanomtom was honored as The Father of Muay Thai and the day of the fight, March 17th is now officially named ‘Muay Thai day' in Thailand. Equipment that is necessary for Muay Thai matches must be provided by the stadium. There are a stopwatch, a signal gong, a warning bell, boxing gloves of various sizes according to the rules, equipment to provide water for boxers, and other additional personal accessories for boxers who have not prepared their own such as boxing shorts in red or blue, jock straps, surgical tape, or sacred cords. Thai boxing can be classified into two major types, the first is muay lak which puts the emphasis on caution and patience, and is very rare nowadays. Theo- ther is muay kiew which is full of tricks and feints performed to catch the opponent off guard. A ' Muay Thai ' match formally have no more than 5 rounds, each round take 3 minutes to last, with a two-minute rest period in between. No additional rounds is allowed. Boxers must regularly wear gloves, each weighing not less than 6 ounces (172 gramm). The gloves must not be squeezed, kneaded or crushed to change its original shape. Contestants must wear standard supporters or sturdy athletic cups to protect their groin,Gum shield may be used. Muay Boran is the predecessor to Muay Thai, hence the word Boran which means ancient. This Thai fighting style developed over thousands of years but its origin is unknown. It was develop as a self-defense system to defend against Burmese invaders. This ancient art compose many techniques from different style within various tribes in different regions of Siam (now known as Thailand.) It incorporates not only striking techniques but also locking, throwing, submission holds, choking, and blows directly to pressure points. Ancient Thai warriors taught in this art are also strongly influence with the Buddhist way of life. An essential part of their training includes meditation and performing spiritual ceremony ritual called the “Ram”. It is meant to focus the mind and to pay homage to the gods and the spirits of their ancestors. Apart from uses in warfare, Muay Thai was considered an activity for fitness training and competition. During the early 1920's, the government of the time has forbidden most of Muay Boran techniques and traditions. Rules and regulation were introduced into Muay Thai competition to ensure the fighters safety. It was at this time that sport Muay Thai was born. The sport Muay Thai often refer to as Muay Thai kickboxing slightly varies from the original art which uses kicks and punches in a ring and with gloves similar to those used in boxing. This has become Thailand's national sport. Ever since this sport was created, many of the ancient style of Muay Thai were solemnly taught or were lost. There are a few traditional Muay Thai master alive that teaches this art. Today, there is movement to preserve this ancient art from being forgotten. 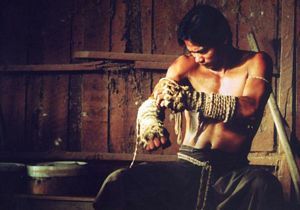 Krabi Krabong, a traditional Thai martial art, utilizes various weapons in combat but also utilize empty hand techniques as well. There is a variety of weapons used in this art which includes a sword, shield, knife, staff and many more. A common practice is the use of two swords to fight. During past Thai history, this style of fighting was practice by Siam soldiers to defend against the Burmese invaders but it is also been used in dancing rituals. This art is still practice in Thailand today, mainly for public display purposes. The Art of Krabi-Krabong is deeply spiritual. Before each show the students need to follow a number of steps. Each step has a very strong meaning inside of the circles of the Thai culture.The whole event is conducted with Traditional Thai music. The music is very important in the training of Krabi-Krabong. It helps to keep the right speed as well as the rhythm.The instruments that they used are: Drums(Kong),Cymbals of three different sizes(Ching), and sometimes a Pipe(Java Pipe). The person that plays the drums is the more experienced; He used the same techniques of Muay Thai and Krabi-Krabong to play. He hit the drums with the knees, head and elbows as well as with the instruments. Here are the steps to follow when you perform Krabi-Krabong. Means that when the students enter the place where they are going to fight, they will salute and pay respect to the people that are there as well as to the opponent. 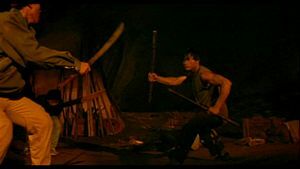 The students adopt the position to start dancing; If two people are going to dance, one person needs to be looking to the right shoulder of his opponent. This person will dance standing up ;The another person will perform the whole ceremony with the knees on the floor. They will dance praying to the four corners, finishing at the same place where they started. The students will face each other, pay respect to each other, and with a series of exaggerated movements will move in circles moving in and out of the circles(to the left only), touching the tips of his weapons when they get close and keeping their eyes on each other. The students will flow with a series of attacks and defenses, fighting in any range trying to defeat each other. When the students end the performance,they will salute each other and salute the public. This is a sign of respect to the Art,and to themselves. Is very similar to a sable. It is used to stab, is thin and sharp ,metallic and is a ground weapon;Normally used by high rank soldiers. Is a wooden bar,made normally from Bamboo, It is 6 feet long. It is very easy to make one and very effective because of it's long range. Is normally a ground weapon and the people that used it are farmers that became soldiers. This is the more popular weapon in the history of Siam. Sometimes the warrior held two swords (One on each hand), this is call "Daab Song Muun" They can be used to stab or slash the opponent. Normally a ground weapon and is a little more curved and heavier than a "Krabi". This weapon is to be used on Elephant-back or horse-back. Normally the King would use this weapon. There is an extensive variety of different spears. When the King was going to Battle on the sides of the Elephant he had different kinds of spears. The end of some look like a knife, others looks like a fork, and some like a sword. Some are for slicing, some to trap the opponents weapon, and some for stabbing etc. The spears consist of a strong and long wood pole and with a sharp metal end. The form changes1 depending of what kind of spear you are talking about. Is a ground level weapon ,made of hard wood or bone. They come in pairs, each one you wear iton the out side part of your forearm. The weapon is used to attack as well asto block .Because it is a close range weapon you can use it very well in close combat. This weapon normally is used to block but you can strike with the edges as well. It is big and round, and is made of metal or skin. This weapon is a different kind of shield, it is long and thing. It covers from the shoulder until your knee and is made of skin or metal and is "HEAVY"!!! This shield is rectangular like DUNG, but is not very long. It adjust well on your forearm. Made from the same materials as the other shields. Buy DVDs, VCDs, CD and books about Muay Thai !